Although tropical environments are often considered biodiversity hotspots, it is precisely in such environments where least is known about the factors that drive species richness. 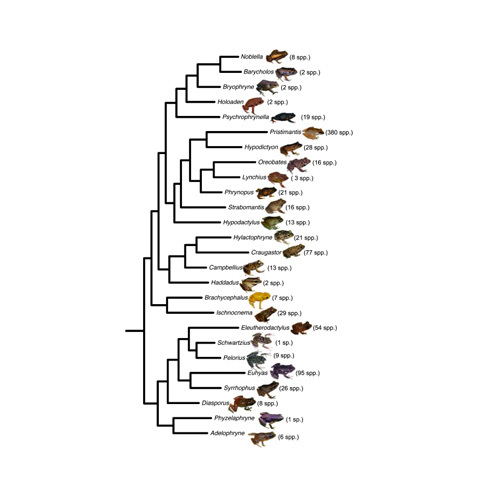 Here, we use phylogenetic comparative analyses to study correlates of species richness for the largest Neotropical amphibian radiation: New World direct-developing frogs. Clade-age and species richness were nonsignficantly, negatively correlated, suggesting that clade age alone does not explain among-clade variation in species richness. A combination of ecological and morphological traits explained 65% of the variance in species richness. A more vascularized ventral skin, the ability to colonize high-altitude ranges, encompassing a large variety of vegetation types, correlated signifi- cantly with species richness, whereas larger body size was marginally correlated with species richness. Hence, whereas high-altitude ranges play a role in shaping clade diversity in the Neotropics, intrinsic factors, such as skin structures and possibly body size, might ultimately determine which clades are more speciose than others.